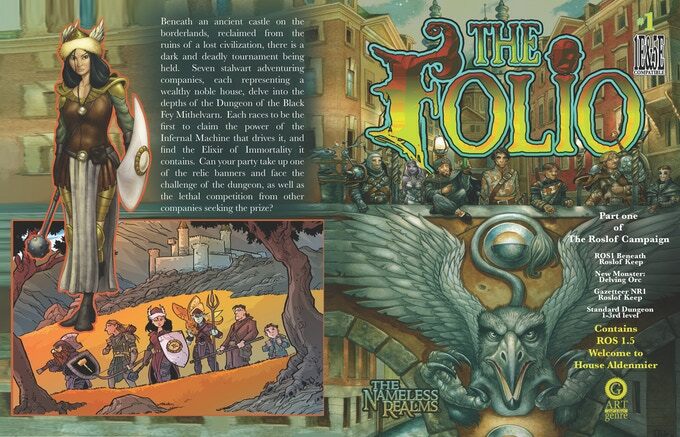 The Folio is one of the most successful, serialized gaming supplements available today and probably the only one that dual stats for both OSR systems and 5e. If you missed out on the start of the series, the Folio #1 1E & 5E Adventure Reprint is your chance to grab a reprint of the first issue, which is also the first part of the Roslof Campaign. Hurry though - just over two days left in the funding period. Three years ago I started the Folio series with a dream of creating OSR inspired adventures that also fit into today's gaming styles. My first adventure was entitled 'Beneath Roslof Keep'. At the time, I had no idea that The Folio would become a 'thing', or that so many fans the world over would enjoy the exploits of this particular dungeon delve. So, as I ring in 2018, I wanted to once again touch base with Roslof Keep, and try to allow new players who might have missed this long out of print module the opportunity to lay hands on it. As it was the first module ever produced by Art of the Genre, I also wanted to have a chance to go back in, modify the content and presentation to match what later became out standard Folio process, and also add-in content not included on first publication. So, if you've ever wanted to own a Folio, start a new campaign, or just want to see what we do here are Art of the Genre, this is a perfect opportunity to get in on the ground floor, or should I say, Beneath Roslof Keep. My Project: The Folio is a 1st Edition & 5th Edition gaming module. It will be produced as an 8x11”, removable cover [11x17" once removed], adventure with mostly b/w interior artwork. The final size is roughly 32 pages of content. Who’s it for? ALL gamers, both new gamers and old gamers as it is easily expandable or playable as is.The concept is to allow gamers a starting point for adventure that can be modified to their liking while providing excellent reference content and framework.The base mechanic will be for 1st Edition AD&D, while having 'grey block' stat blocks for 5th Edition D&D, but I’ve designed it to be readily modified to any fantasy game. What’s in it? It has been written by myself and my OSR compatriot Mark Timm, with incredible cover art from old school masters and interior artwork by skilled black and white illustrators Travis Hanson and Michael Wilson, and even a bit of Jim Holloway because I can never get enough Holloway. We are intent on providing a polished and modern design with creatively nostalgic content that transcends a particular age. The Folio will contain a 3-D map, a Gazetteer, a monster section, a new monster unique to the setting, DM’s notes and guides, and a full adventure.